Layer 3 switch series with enterprise-grade features that’s simple to secure, deploy and manage with Aruba ClearPass Policy Manager, Aruba AirWave and Aruba Central. Support for static and RIP routing, IPv6, ACLs, built-in 1/10GbE uplinks and PoE+. 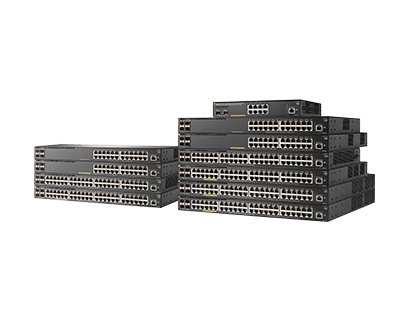 Convenient built in 10GbE uplinks and up to 740W PoE+. With Zero Touch Provisioning and support from cloud-based Aruba Central, you can quickly set up remote offices with little or no IT support. Consistent wired and wireless experience with ClearPass Policy Manager and AirWave Network Management. Aruba 2930F switches are easy to deploy and manage - optimized for mobile users with an integrated wired and wireless approach. Interact with product animations in this online 3D model using simple gestures to explore the product. Idle power is the actual power consumption of the device with no ports connected (not applicable to the 8G switch). See www.hpe.com/networking/warrantysummary for warranty and support information included with your product purchase. To find software for your product, refer to www.hpe.com/networking/support; for details on the software releases available with your product purchase, refer to www.hpe.com/networking/warrantysummary. For documentation including manuals for your product, refer to www.hpe.com/networking/library. Warranty: See www.hpe.com/networking/warrantysummary for warranty and support information included with your product purchase. Service: For support and services information, visit https://www.arubanetworks.com/support-services/arubacare/.